Given recent weather, your author thought he would recommend a spot today that is good in both sunshine and showers. Nestled beneath Waterloo Bridge, which also provides shelter for the adjacent book market, the Riverfront Bar and Kitchen at the BFI Southbank is another triumph for the organisation, providing an excellent spot to sit and watch the world - or the South Bank at least - go by. 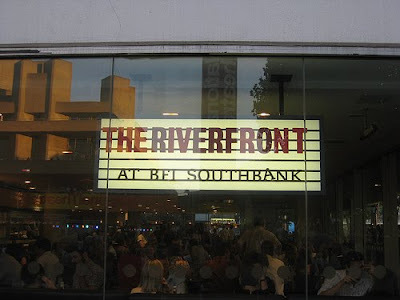 Being the Southbank, it all comes at a price, and your author tends to buy half pints and avoid eating, as he is notoriously cheap. However, it is lovely and the outdoor area in front, looking out towards the river, is particularly pleasant.